Click the button below to add the CONCENTRATED DEODORANTS to your wish list. 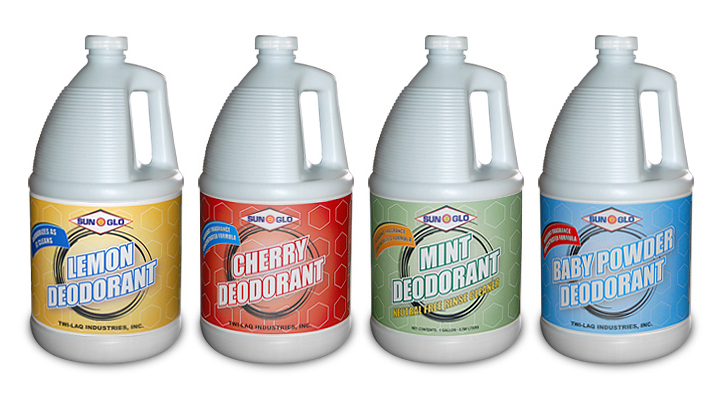 All Sun-Glo deodorizers are Industrial Strength Deodorizing Cleaner Concentrates. All our concentrated deodorants consist of water-based formulations that containing premium fragrances and a robust surfactant/detergent blend that makes them much more versatile than an ordinary deodorant. All Sun-Glo Deodorants are very effective as light-medium duty neutral cleaners and each has a neutral pH making them an excellent choice for daily mopping of finished floors.. Available in the following stock fragrances: Lemon, Cherry, Mint, Baby Powder. Other fragrances also available for custom blending.